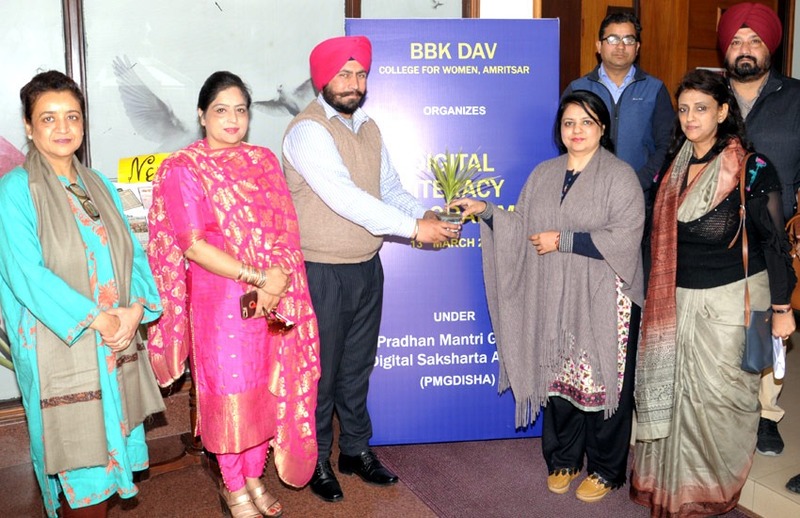 NCC and NSS units of BBK DAV College for Women in collaboration with Kirpa Placements organized a Digital literacy program under Pradhan Mantri Gramin Digital Saksharta Abhiyan. The seminar was organized to create awareness among students about the various government digital initiatives viz use of the internet to book tickets, to pay the electricity bills, to recharge mobile and thus make our life easier. An enlightening lecture was given by Mr. Iqbal Singh, Head of Kirpa Placements who enlisted the various transaction applications like paytm, phonepay, googlepay, amazonpay etc. The students were also imparted practical training about the use of these applications and how these applications can be a source of income. Ms. Rupinder Sandhu, President of Captain Gurdip Singh Society, an NGO told the students about the digilocker application which can be used to store certificates in the digital form. She also talked about the mygov.in web portal through which we can know about the various schemes launched by our government. She also acquainted the students with the digital work application which can be used to carry on work from home and national scholarship portal through which students can get knowledge about the various scholarships launched by the government. Principal Dr. Pushpinder Walia congratulated the team for their efforts and added that the need of the hour is to be aware about the various digital initiatives of the government for the welfare of the society. On this occasion, Ms. Kiran Gupta, Head, Department of Computer Science, Dr. Aditi jain, NCC caretaker, Mr. Anurag Gupta (Associate Professor, Computer Department), Ms. Priya Sharma, NSS program officer, Mr. Kanwarpal Singh (Assistant Professor, Computer Science), Ms. Priyanka Chugh (Assistant Professor, Commerce) and Ms. Sumeer Kaur (Assistant Professor, TTM) were also present.